007 – Name of the Rose | All Eighties Movies. All The Time! 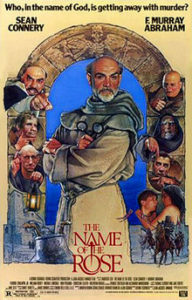 In what turns out to be accidentally completely ironic, episode 007 stars Sean Connery as Brother William in the 1986 murder mystery, Name of the Rose. Kick back relax and enjoy as Gidgit Von LaRue and AngryMan look in to whodunnit ! This entry was posted in Podcasts and tagged drama, name rose. Bookmark the permalink. I cannot believe I’ve found a pod cast about this movie. I adore this film and seems none of the other pod casts about this era have covered it. It took a lot of searching to find this and may I applaud you both over a really great pod cast. This is a very underrated movie yet it is really one of my favorites from the eighties. Again thank you. You paid it true credit and homage to a wonderful movie. No way I found this pod cast?? This is 1 of my fav movies ever and thank god to twitter I found this. I have seen this movie so many times. Thank you Gidget and Angry as I adore this movie. Baskerville and Melk yes pls!